Bird & Buffalo added an awning for outdoor dining. Another fast-casual Thai restaurant is set to debut in Temescal next week. 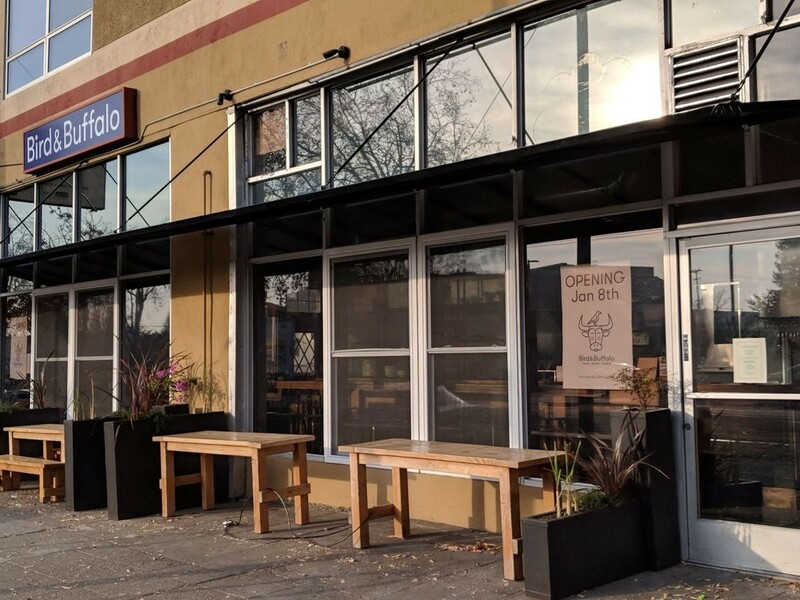 Bird & Buffalo (4695 Telegraph Ave., Oakland) promises to be a low-key neighborhood restaurant, taking over the former Rosamunde Sausage Grill space. It’s a significant change of pace for the ownership team, which also runs the chic Soi 4 Bangkok in Rockridge as well as Basil Thai and Basil Canteen in San Francisco. It softly opens Monday, Jan. 8. The name describes a common sight when folks leave cities for the Thai countryside: a water buffalo striding alongside race paddies with a bird resting on its head. The short menu features fried snacks, curries, grilled proteins, papaya salads, and larb salads. Unlike the curries at Sirimongkolvit’s other restaurants, these are specifically inspired by street curry stands, where you point to whatever curry you want and it’s poured directly over rice. With larb and Lao-style sausage, the offerings definitely dabble in Northern Thai and Isan cuisines, but Sirimongkolvit emphasized that Bird & Buffalo is more about capturing a general countryside flavor than a specific region. As for the space, expect a relaxed and snug atmosphere with just 20-30 seats. Sirimongkolvit added awnings for picnic tables on the sidewalk and hopes to fill the restaurant with plants. Bird & Buffalo will offer 10 beers on tap — a mix of Thai, Lao, and local — and stock a few wines, though Sirimongkolvit said this style of food is better suited to brews. Of all the menu items, Sirimongkolvit is most excited about the restaurant’s five or so dipping sauces — spicy chili tamarind, smoked chili, and peanut among them — which can be ordered with snacks or grilled meats.